Tubigrip Support Bandages are manufactured by Molnlycle Wound Care to be used as an Anatomically Shaped Bandage. This anatomically shaped bandage is designed for venous disorders. Tubigrip is a Tubular Shaped Support Bandage (TSSB) that provides aid for venous and lymphatic return. The Tubigrip Shaped Support Bandage functions as Compression Support Hosiery and is useful in the management of venous disorders of the legs and arms. TSSB may also be used as an undercast stockinette in cast bracing and for support following cast removal. Tubi Grip also provides pressure therapy in the treatment of post-burn scarring. 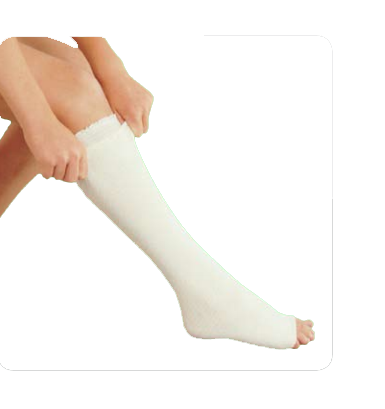 Tubigrip® Shaped Support Bandage TSSB is constructed from cotton, polyamide and elastodiene to provide an anatomically-shaped Tubigrip that provides support to the limbs. The Tubigrip cotton has elastic threads laid into the cotton fabric to form free moving support spirals. The Tubi Grip fabric is available in two colors – natural and beige. Tubigrip Shaped Support Bandage provides lasting, effective support while allowing ambulant patients freedom of movement. The Tubigrip Bandage stretches to provide support without wrinkling or slipping. TSSB can be washed or autoclaved for repeated use, without loss of efficacy. Reapplication after washing Tubigrip is quick and easy for patients. For sizing, measure around the largest area of the patients’ calf or forearm and match to the chart provided below. The TSSB product assortment ensures a good fit for the majority of patients. Molnlycke Tubigrip TSSB Sizing Guide. Anatomically shaped for below the knee to provide support along the complete length of the limb. Elastic cotton fabric construction is comfortable as well as effective. Simple size selection is quick and convenient. Reapplication after washing is quick and easy for patients. 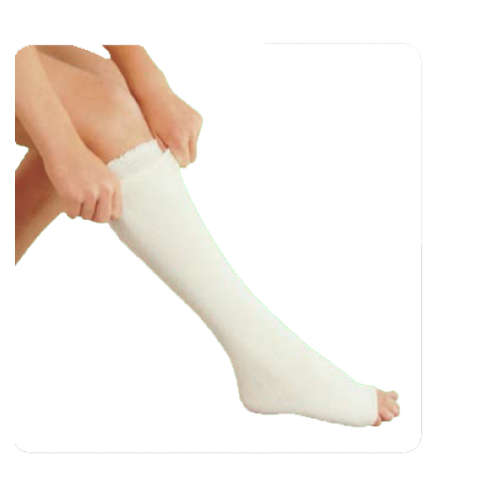 Molnlycke Compression Stocking Product Options: 1472, 1473, 1474. Size Options: Small, Medium & Large. Construction: cotton, polyamide, elastodiene, (natural rubber latex). Can the tubigrip be used above the knee on the upper leg? This specific product can only go to approximately at or below the knee for proper recovery. We recommend looking at our thigh-high hoses for a better option. What it the pressure for your Tubigrip Tubular Shaped Lymphedema Support Bandage. Thank you. The manufacturer states with proper sizing and double-layered placement (recommended), Tubigrip will provide 10-15 mmHg (millimeters of mercury) of pressure. I'm unclear about how to measure my leg for the sizing. Is it from toes to below the knee? To measure for the proper size, the manufacturer suggests measuring from the widest part of the lower leg. For compression, simply follow the guide available on the page.